Franka Potente - the Famous "Lola"
In 1998 the film Run, Lola, Run saw the light; the main role had been played by a young German actress Franka Potente (Frenke Potente, as it is spelled sometimes). This lady had played a lot of roles and taken a big number of different awards and nominations, but the role of Lola who always runs from something and somebody had definitely become one of the main roles in Franka Potente's career. 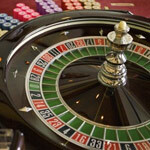 Thanks to the magnificent play of Franka, her "Lola" can be found in the list of the famous roulette bets. So, what has she done in order to be there? 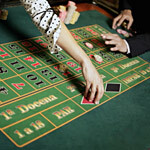 Lola comes to a casino to play roulette but finds out she does not have enough money to buy roulette chips: she gains the sympathy of a casino employee and he sells her one 100-mark chips for the money she has (even if it was enough). Lola places her bet of 100 marks on number 20and wins; but she does not give up and continues her playing: she bets on 20 again and wins! Her winnings are 129 600 marks now and that is much more than her boyfriend owes his boss. Well, as far as we can see, Lola did not want to prove anything by her playing like Derren Brown for example: she just came and won! Our congratulations! This young and beautiful actress was the one who gave a birth to "Lola": this role has become her breakthrough indeed! What do we know about Franka Potente? 22 July 1974 - was born in Dülmen, Germany. 1994 - entered the drama school in Munich but give it up for studying at the Lee Strasberg Theatre Institute (New York). 1995 - the debut on television. 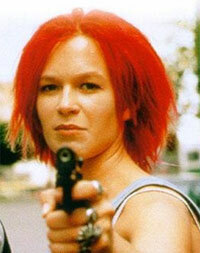 1998 - Run, Lola, Run that made her to become popular. She went to the USA to play in some Hollywood films but then came back to Berlin. Now Franka continues working with German directors. Franka Potente had won 7 awards and had 6 nominations; she played in 38 different films. Look the full filmography of this wonderful actress here.